How To Snag The Perfect Family Getaway On The Coast! We all need a family getaway that involves nothing more than island frolicking, relaxation, and sand between your toes. One piece of this fantasy is a cozy cottage close to the shore for a great price. It’s not a fantasy, y’all. 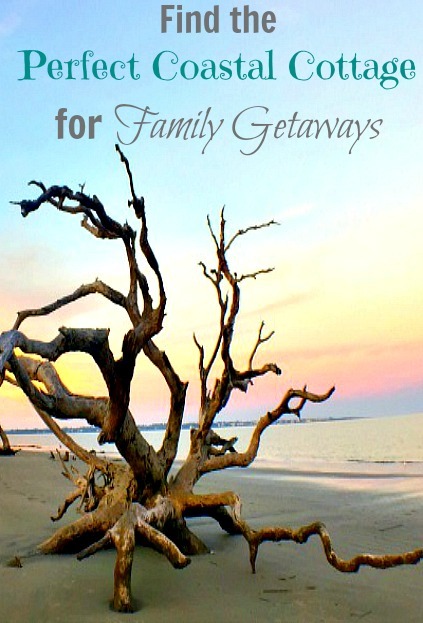 Here are the highlights of our perfect family getaway near the sea at a Jekyll Island Georgia cottage …..
Jekyll Island Georgia is a picturesque island that became a State Park in the 1940’s after serving as a private retreat to the rich and famous elite like William Rockefeller, J.P. Morgan, and Joseph Pulitzer. 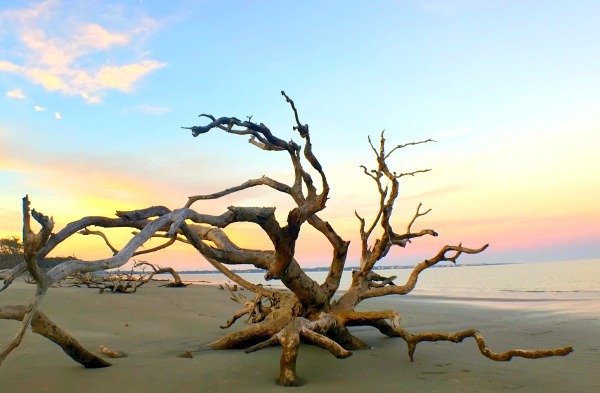 Jekyll Island is a natural landscape of wide beaches, maritime forests, wildlife, historic sites, biking trails, and thriving ecosystems. Once your feet touch the sand of Jekyll Island, you will always return. After driving across the seven-mile causeway from the mainland, we found our cottage rental tucked into a quiet little neighborhood under a canopy of trees. When I saw the quaint front porch, large windows, and colorful front door, I knew that our fantastic family getaway had begun. The entire cottage was a breath of fresh air with its bright white tongue-and-groove ceiling and exposed beams, beautiful tiled floor, and shabby chic furniture. The fully-equipped kitchen streamed with light and a view of the huge backyard. Every appliance you could ever hope for was there because they’d thought of everything. Bottled water, coffee k-cups, and plenty of creamer waited for us to use while detergent, cleaners, trash bags and more were at our disposal. Out back there was a grill, family games, and bikes that we were free to use as we pleased. The large master suite was charming with lots of light, coastal books, and a huge closet. The guest bedroom was large also with two twin beds, a large closet, and a flat screen TV. A bathroom separated the two bedrooms and may have been my favorite with its tiled shower and wainscoting. Special touches were in every room from magazines, guide books, maps of the island, blankets, and an extensive basket of toiletries. Our first afternoon, we visited the Jekyll Market to get breakfast items and snack emergencies. 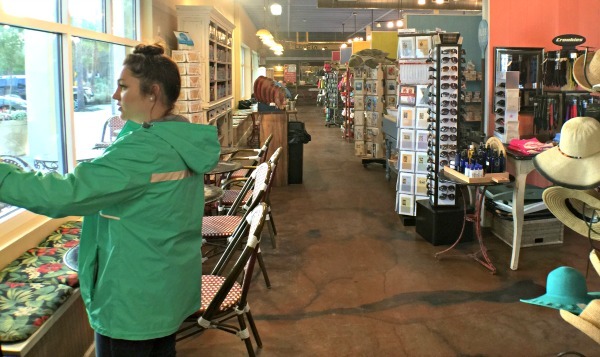 Not only does this unique shop have every food, personal care, outdoor essential, or decor item that you could ever want, there’s also a restaurant, deli, bakery, and ice cream parlor. Yes, all in one place! 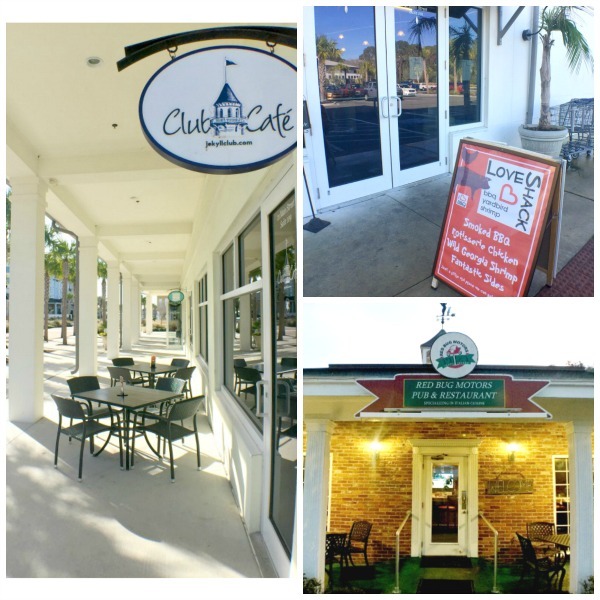 When you’re getting hungry, there’s a snack shop, yogurt shop, sweet shoppe, coffee shop, and about fourteen full-service restaurants on Jekyll Island (with only one fast food restaurant). Over the course of our stay, we found ourselves at The Love Shack Barbecue, Uncle Vance’s Coffee Shop, The Club Cafe, and Red Bug Motors Pizza. 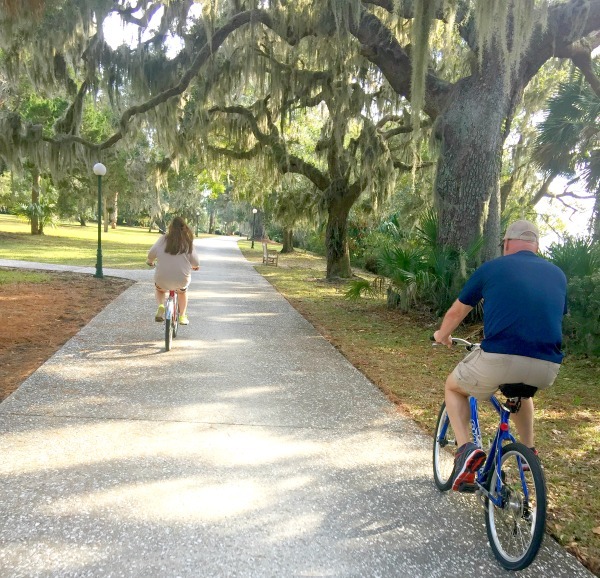 There are such many unique, family friendly things to do on Jekyll Island from bike riding through the historic “millionaires” district to kayak excursions on the marsh. We started our first full day by rising early to walk part of the 10-mile stretch of wide beaches. Nature photography, peaceful exercise, an “island treasure” hunt, and long talks along the shore resulted. 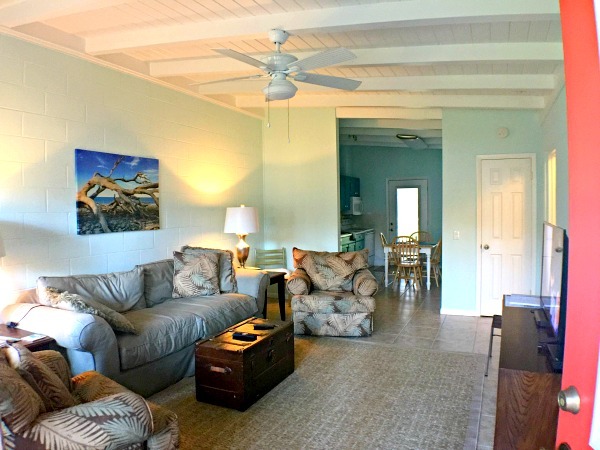 We retreated to our adorable cottage to relax before heading out again for a family bicycle ride around the island. Remember those family bikes in the backyard? What a blessing to be able to grab them at our whim and take off. There are about twenty miles of bike trails on the island and we literally covered half of that. So. much. fun. Since Jekyll Island Georgia now has over 25 miles of paved bike trails and wooden bridges, we discovered the beaches, forests, marshes, fishing pier, the Landmark Historic District, and more from a fun perspective. Ask for a bike trail map when you stop by the Visitor’s Center for great routes to enjoy! Along our path was the Island Sweet Shoppe filled with old-fashioned candy, hand-dipped ice cream, fine chocolates, and homemade fudge. 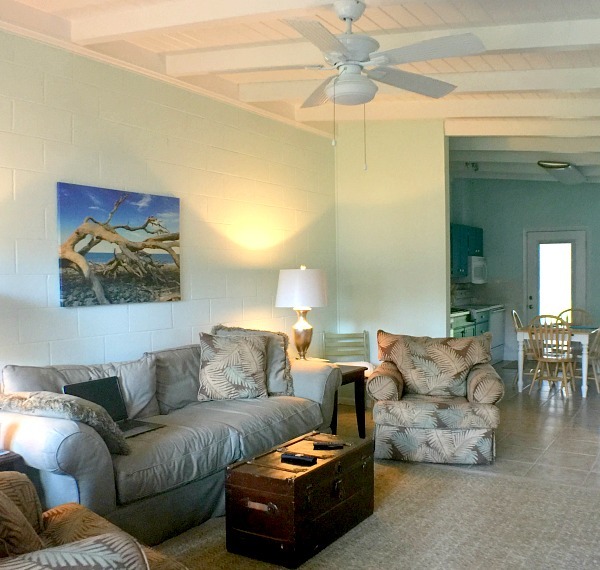 The newly renovated beach village in the center of the island with boutique shops, a convention center, and restaurants is a gorgeous area to spend some time. 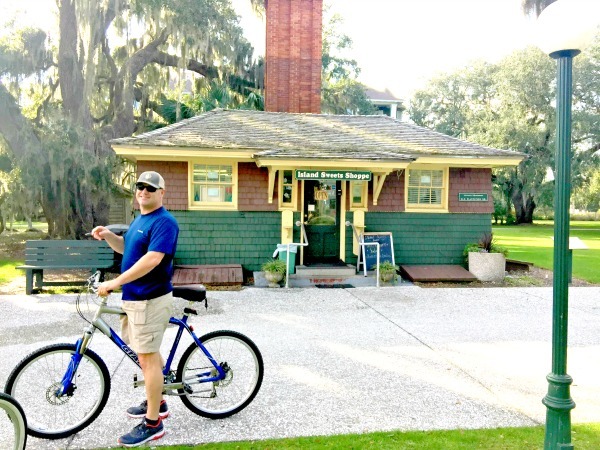 The last stretch of our family bike ride was along the seashore to return to our perfect, Jekyll Island Cottage. Bike helmets are required for riders 16 years & younger. Bring your own accessories for the beach. Can’t think of anything else except clothing, toiletries, and food. 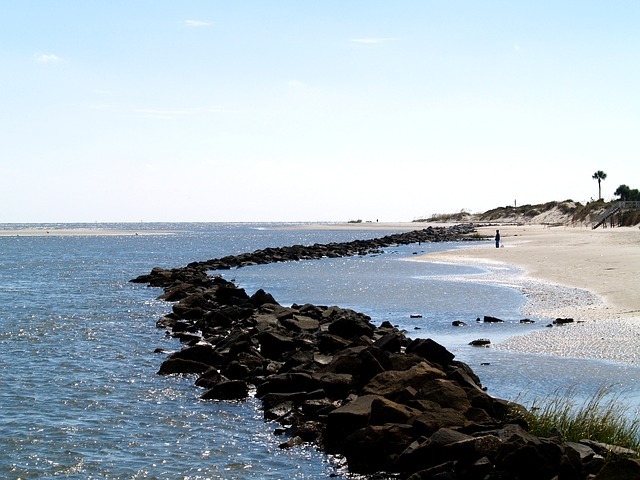 There are five Jekyll Island Beaches. Find them all on the map provided in this cottage. Great Dunes Beach has great public bathrooms, picnic tables, and beach access for families. Our cottage rental was side “A.” An independent cottage of its own, side “B” had a separate entrance and driveway. The only thing shared between both sides was the large backyard. I’d love to return and share the property with another family or family members and create new family vacation memories. Click here to see details about both sides of the cottage and choose to rent one of them or the whole thing! My thanks goes to the owners of Sandy Toes and Salty Kisses for a memorable family vacation. We thoroughly enjoyed the warm hospitality, special touches, and coziest cottage we’ve ever seen. That looks incredible I’ve never heard of this Island but looks like my ideal vacay. I love low key barrier islands!!! Thanks, Harmony! That’s one reason I love it – it’s still somewhat of a secret. WooHoo. “Low-key barrier islands” describes it perfectly! Thanks for stopping by. That cottage looks dreamy. Love how they have everything for you and bikes to enjoy the trails. Beautiful place! Wow! Looks wonderful. Interesting name Jekyll Island was it? This place looks like perfection!! Yes, Kenya. We loved it. Thanks for stopping by. This looks like an awesome trip!! That cottage looks so cozy! 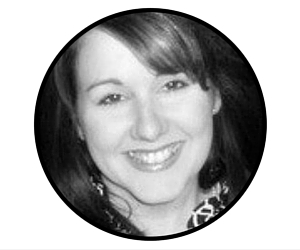 It was – and so fun, Stephanie! Thanks. Thanks, Gladys! We all need one now and then and this one was what we needed for sure! I have heard a lot about this place. It sounds like a great getaway! Word is getting out! Thanks, Melanie. I love Jekyll Island!!! I visited several times when I lived in Savannah. Never knew about the beach village though! Granted it has been about 8 years since I have lived there lol. Thanks, Danielle. It was so fun but more than anything, it was incredibly relaxing. This looks like such a beautiful getaway! It sure is, Rachel. Thanks for stopping by! I’ve never heard of Jekyll island before. It looks amazing! We are looking for a vacation to celebrate my 30th, so we’ll have to look into it!! Thanks! Awesome, Devon. Let me know if you have any other questions and I’ll be glad to help. Never heard of it before. Thank you for sharing. Looks like an amazing place to visit! Thank you, Bailey. It’s amazing. This looks like a fun island to visit! I have this theory that if I go to one of these places I would never go home. I love small coastal or lake towns. They are my favorite. Wow! We have just been trying figure out where to go as a family for vacation. We have done all the touristy things, and wanted something quaint and quiet. Thank you! I had never heard of this! This place looks perfect!! AS a Georgia transplant I will definitely be checking it out!! What a lovely spot! I’m a western girl and I would never think “Georgia” when searching for a beach vacation. Thanks so much for sharing! Looks like a best kept secret! Love that it is close to my home (Alabama), so I will definitely be looking into this for a future trip. Thanks for sharing!! What an adorable cottage. Your description makes me want to pack up and go now. Looks like a great place! I love beach towns. Looks like so much fun! It would be the ideal spring break or summer vaca! This island looks totally awesome! I would love to bring my family there someday! !